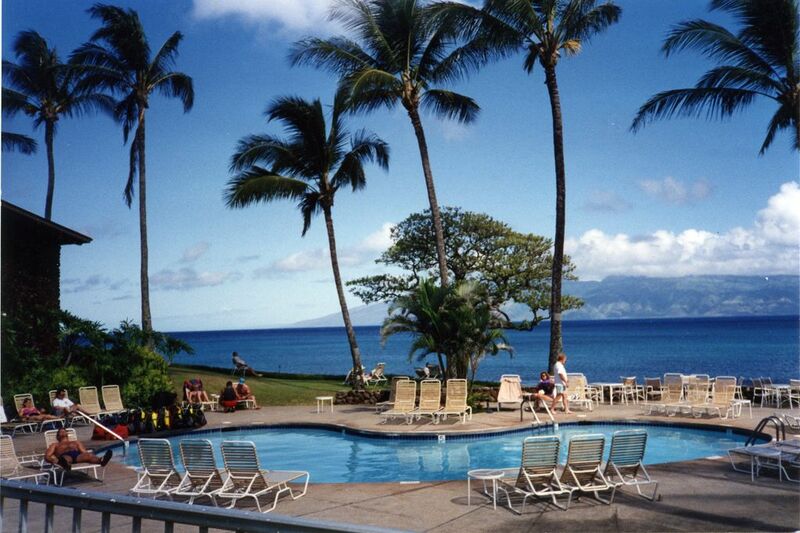 NAPILI Shores Resort is een 152-eenheid, laagbouw, condominium complex gelegen aan de westkust van Maui, tien mijl ten noorden van Lahaina en vier mijl ten noorden van Kaanapali ... het aanbieden van twee buitenzwembaden (een is verwarmd), bubbelbad , twee restaurants en een full-time activiteiten directeur. Napili Shores Resort is gelegen aan het zuidelijke einde van Napili Bay ... een wit zand, halvemaanvormige strand ... perfect om te zwemmen, snorkelen, wandelen op het strand, of gewoon relaxen in de zon. Dit luxe appartementencomplex is gelegen binnen een 6. 3 hectare tropisch aangelegde Outrigger Resort. H-264 genadig verwelkomt gasten met meubels en kunstwerken die zijn casual elegant. H-264, is een tweede verdieping, 1 slaapkamer appartement ... dat slaapt twee rookvrije volwassenen. De LANAI biedt een adembenemend uitzicht op de blauwe Stille Oceaan, het eiland Molokai, weelderige tropische bomen en schitterende bloemen. Een entreeprijs van $ 75. 00 is vereist door het resort op het moment van inchecken. Sleutelwoorden: Oceanfront Condominium, ontspannend, romantisch, ruim. Radio, plafondventilatoren, 2 zwembaden (gedeeld & één verwarmd), een wasserij voor het gebruik van de gasten bevindt zich onder de lobby en gratis parkeren! We loved the location, the ocean view, and the place itself was well taken care of and clean. The sounds of the ocean waves at night was very peaceful. This is a nice part of the island to relax and enjoy. The Gazebo restaurant on property serves great breakfasts and lunches. To avoid the line to eat in the restaurant as space is limited so call ahead and enjoy your meal by the pool or your lanai! The unit is very nice and has everything you'd need to cook a nice meal or entertain friends or family. Over the last thirty three years we have stayed at Napili Shores over ten times in various units including right downstairs from this unit. This was by far the most comfortable, beautifully appointed and well equipped unit we have stayed in. Not to mention the view is perfection. The personal touches and attention to detail made us feel as if we were in someone's home not a random rental unit. We hope to return soon! This property was fantastic. Nicely remodeled and includes all the necessities that are needed. Queen bed was very new and comfy and all the towels were new and everything was clean and very welcoming. Check in was a breeze and the entire stay could not have ben better. Frig had condiments and the cooking pots and utensils were top notch. The screen door was fixed immediately and we had a wonderful stay. Owners are very good with communications and in letting us know in advance as to what to expect. Our expectations were exceeded. Dave C.
A perfect place for vacation! My wife and I stayed in the condo for one week in early April 2018. We had such a lovely time that we definitely want to stay there again at a future Maui trip. The place comes with a wonderful view of the Napili bay. The condo had a recent bathroom and kitchen renovation that was spectacular and a pleasant surprise. The grounds are well cared for, and the nights are quiet. The condo came with beach chairs, beach umbrella, a boogie board, and some snorkel gear (we did rent our own snorkel gear however). The condo was clean and easily accessible from the parking lot. Laundry is located below the office. We enjoyed the breakfast at the Gazebo, but get their early (like 7:15AM or order to go). The food at the restaurant on the property and the resteraunt on the other end of Napili beach were excellent. We went to all of the fancy and well known beaches on Maui, but Napili was our favorite. A true hidden gem. The water is clear, the snorkeling is great, and multiple sea turtles visit it the late afternoon. There is a grocery store up the road from the condo, which was really convenient. We have stayed in expenseive resorts in the past, but this experience was far more enjoyable and relaxing. We hope we can come back to Maui really soon! Wild te bekijken (Bultruggen komen in december en blijven tot april).